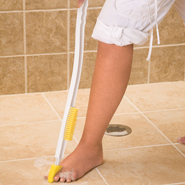 This product along with the companion wand is very helpful for my husband who has limited bending and mobility issues. Everything was great, ordered the item and it came within a week, no hassles no problems and at a great! price, thanks Walter Drake you made my life easier. Does the job, but necessary softness makes for a shorter life. 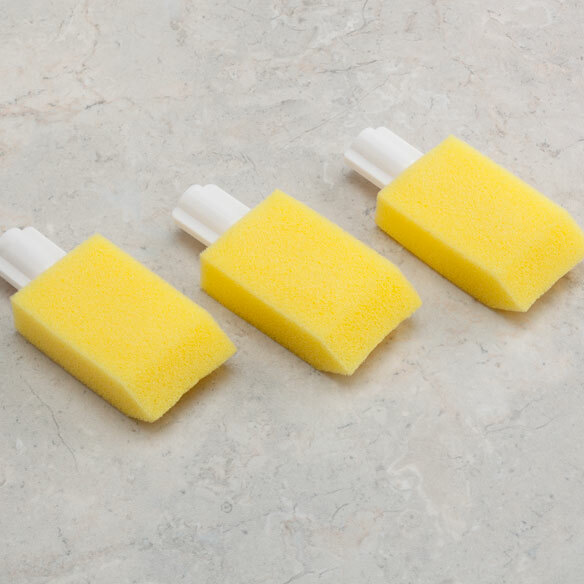 Great item, but it gets expensive replacing the sponge heads way too soon! They sometimes only last for two or three uses. the sponge that screws on the end doesn't stay put. It falls off making it ineffective. I have been using these little sponges for many years. They are comfortable and do a good job. Extra refills for foot brush; helps with back issues. Convenient to use anywhere to apply lotion, cream, and or medication in hard to reach areas. I HAVE LIMITED USE OF MY ARMS AND SHOULDERS. NEED HELP BENDING ALL WAY DOWN..
For backup for foot cleaner. I can't bend to wash feet. These help. I wish they lasted a little longer. convenence easy to use from wheel chair. To have extra on hand. I hope it will help with applying lotion to my feet safely. Having extras on hand is helpful. They last only one month. Good for extending reach and comfort for feet. I want to be sure I have extra on hand when needed. works well for someone with knee or back problems.